This book is an editorial project on the meanings of Fashion System today in a future perspective. Its purpose is standing out among the publications on the subject because of its easy approach to this very interesting and fully investigated world. It will be particularly interesting for students on the subject because it introduces them to the huge range of issues raised by the creative, production and communication processes involved in fashion businesses. Arturo Dell'Acqua Bellavitis is Director of the Triennale di Milano and Full Professor of Industrial design, Interior design, Textile design and Fashion design at Politecnico di Milano, Italy. 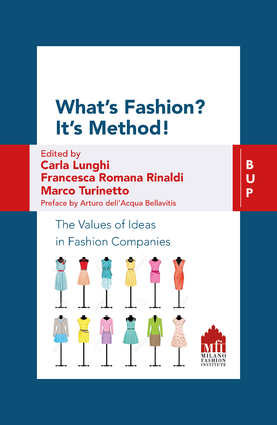 Carla Lunghi is an Associate Professor at the Sociology of Cultural Processes department, Università Cattolica, where she teaches Social Communication and the Evolution of the concept of Made in Italy. Francesca Romana Rinaldi is Professor in Management of Fashion Companies at Bocconi University and SDA Assistant Professor at SDA Bocconi School of Management. She is Director of the Master in Fashion Brand & Business Management at the MFI, Milano Fashion Institute. Marco Turinetto is Professor at Politecnico di Milano. He is an architect, journalist and researcher at the Politecnico di Milano, where he teaches and researches. From several years, he designed and developed new marketing strategies on how to build and reposition the brand in the high-end of the market and brand-extension. At the Politecnico di Milano, he is scientific director of Modacontents / Tremelloni, with cultural consulting on his knowledge of fashion.